Beginning of this month Goliath Technologies released their newly designed dashboard with their Citrix monitoring solution. Before that their console, which had an awful lot of metrics, looked a bit 90s. We spoke about that on several occasions. I try to give positive feedback to vendors while looking and testing their products. I’m happy to see that they did some very good work on the dashboard. I’m sure customers will also approve of this. I wrote some articles about Goliath in the past. Back then with the old dashboard but it will show the level of deep dive they have for Citrix. Citrix solutions themselves are good to work with for daily management but they lack the end to end visibility that Goliath for one can offer. Interested in the past articles? please take a look here Goliath renames their Citrix hosted Logon simulator to App Availability testing for Citrix here Proactive management of end user experience using Goliath Performance Monitor and Goliath Logon Simulator and here Goliath Logon simulator for Citrix. If you look at the Citrix consoles it is more focused on management of the environment when monitoring. Customer need to have an insight in who are connected. What processes are hanging and what is the connection between the VDA and the client. Needed tools but next to that a good monitoring tool that shows the status of the Citrix environment and dependencies is required. Goliath already offered that but now with the new dashboards they make it more usable. Let me show why. .In their new design they have a layered dashboard, going from the highest level of a Citrix environment down to the catalog and delivery group. I received the screenshots from Goliath as I was preparing for a webinar to look at the Citrix monitoring market. So the text in the screenshots is to explain what it is, handy I thought. If you have multiple Citrix delivery controllers or Active directory servers Goliath technologies will automatically auto scale and show them as one components. If you double click on it the real number will open up. This makes it much more usable in large environments where you have hundreds of components. First level or top level is infrastructure. All infrastructure related components are shown here with corresponding alerts. On the right side of the console you see the metrics received and usable at this level. Quick and easy. Some other metrics are shown in the lower part of the console. This is the information you also see in the Director console. Here you just get some more details and a direct drill down option. Second level is the Delivery level. Here you see the delivery groups and the catalogs and all the metrics around them. A lot of information that is not directly available from the director console. Third level is the machine level where you get the nitty gritty machine details. Here we see CPU, CPU ready, memory and so forth. This drill down is very important I think and makes the solution very useable next to Director and NetScaler. This is not the only dashboard they changed. When you read my previous articles on them you noticed the logon simulator. The dashboard for that one has been redesigned beyond imagination. Before they had very very much details in the dashboard but some customers complained it was not that easy to find the metrics. So as they did with the previous mentioned dashboard this one also got a freshen up. 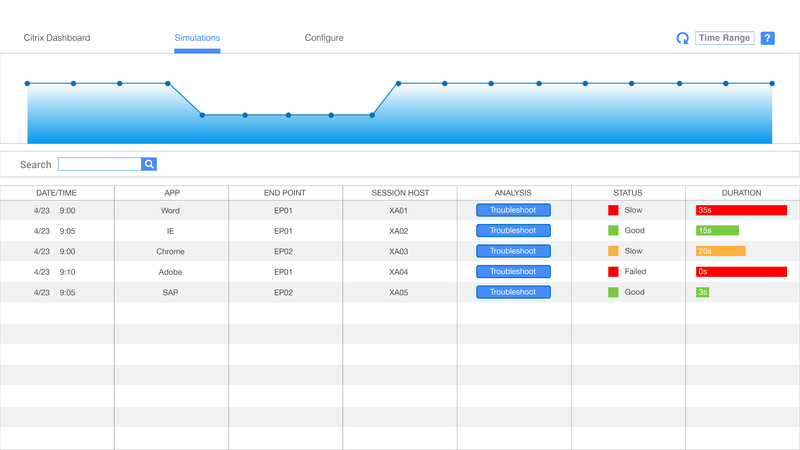 The top bar of the dashboard show the option, the Logon dashboard, the simulations you’re execution and the configuration. This is the Goliath Technologies Citrix Logon simulation dashboard. You see the logon simulations over a period of time. At the bottom you see the different steps and how long each took. When you switch to the second tab you will see the actual executed logon simulations. It shows the status and the duration of the simulation. If something goes wrong or takes to long you can go into troubleshoot and see each subsequent step it took and where it went wrong. The deep dive they had here is not gone the clutter they showed (as they showed the raw data) is cleaned up and now a filter is shown. It shows exactly enough to troubleshoot and gives a much better console to show to customers. It’s a short overview of their redesign but I wanted to get some focus on this as they worked hard to get here. The redesign improved the product immensely I think, good clear dashboards are a must have in this complex world.